A lovely emerald green swan with a crystal neck and head made by Duncan Miller glass. Measures 5 1/4" tall and is about 6" long. 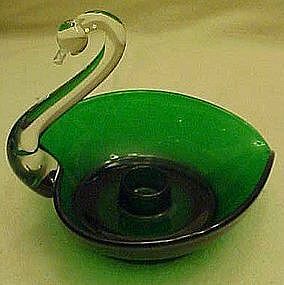 This swan is a candle holder and has the center area that will accomidate the taper candle. Tiny flake on the side of the beak. Only noticeable to the touch.